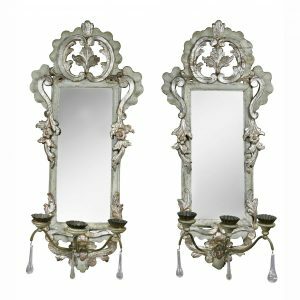 Nicely water gilded in 23 carat gold leaf with old oval mirror plate set in an elaborately carved frame with arched rocaille and floral crest over a pair of flanking Phoenix birds terminating in scrolling and rocaille base. Note- Very similar mirror pictured in English Looking Glasses By Geoffrey Wills Plate 88 from a design by Thomas Johnson published 1758. In good condition with wear consistent with age and use. It’s very nice and retail ready after $2,000 in gilding restoration. Provenance; Greenwich Ct home.